Colombia is a country blessed with three mountain ranges. Whenever one looks out the planes, one can see endless mountains. We witnessed this as we drove out of Medellin to Jerico and Jardin, when we flew out of Bogota to Popayan, and of course, during the Ciudad Perdida trek, where we climbed and descended parts of Sierra Nevada de Santa Marta. 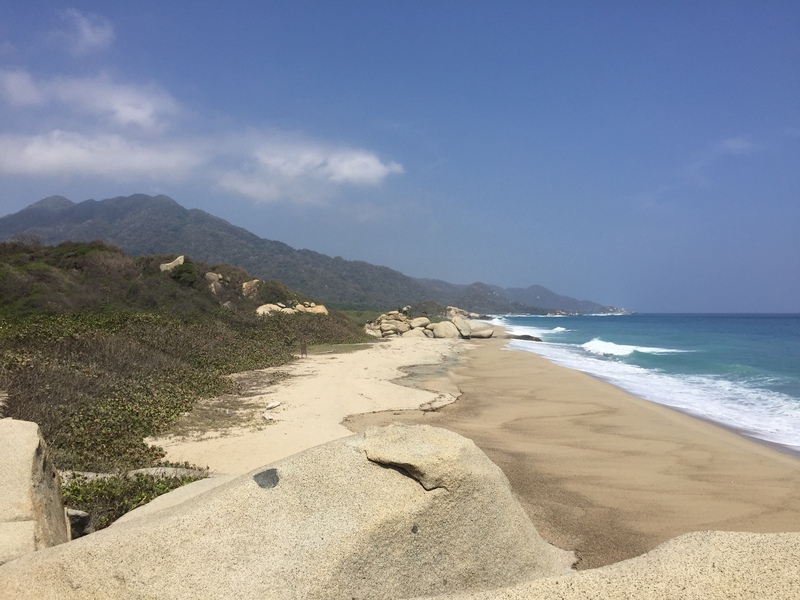 Colombia is also blessed with beautiful beaches of the Caribbean Sea as we saw in Parque Nacional Natural Tayrona. We did not go to the Pacific Coast but we heard amazing things about the beaches there. And let’s not forget the deserts. We went to La Guajira peninsula to experience our desert excursion, however, there is also another desert, called Tatacoa. All of the natural wonders in Colombia cannot be visited in a month – there are that many. We selected a few that pricked our interests and we are sharing these places with you. This trip reminded me of my 4×4 trip from San Pedro de Atacama, Chile to Puno, Peru, passing through the arid high plane (alto plano) of Bolivia. Both are harsh conditions with magnificent, rugged landscape. 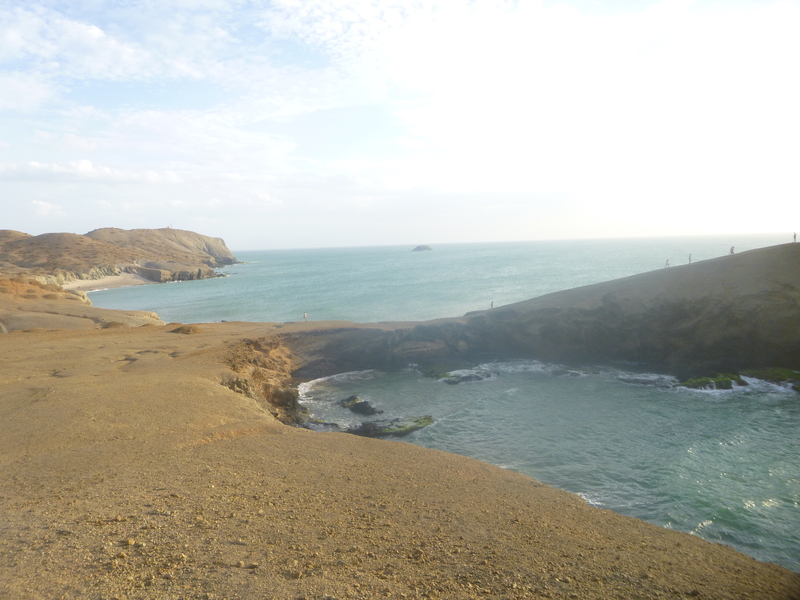 I find La Guajira is very amazing! You have desert and beach at the same time! My only complaint about La Guajira is that when you are closed to the city of Uribia, one can see trash strewn on the desert. This trash has been blown away by the wind since there is not garbage collection or any way to handle the garbage in La Guajira. I hope the Colombian government will one day sort out a solution for this. We went with Magic Tour for 3 days and 2 nights. 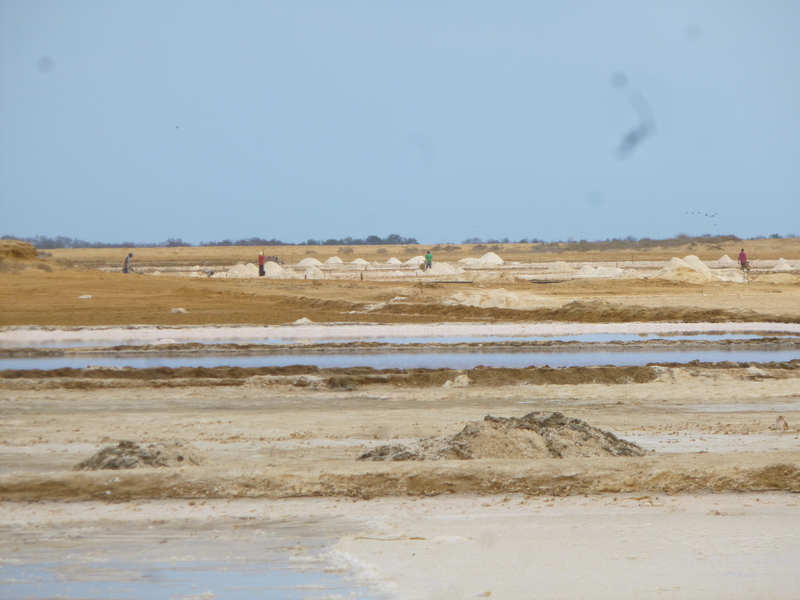 We first drove by a salt field in Manaure, then we went to the biggest city in the region, Uribia. The first night we stayed in Cabo de La Vela, where the beach is nice and the water is blue, but full of jellyfish! 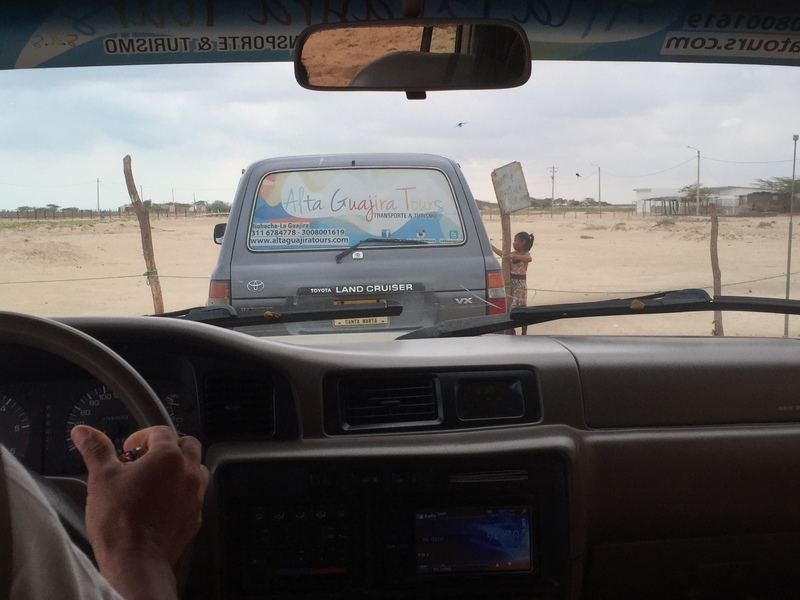 We came across some Wayuu children and women selling their crafts in Cabo de La Vela. 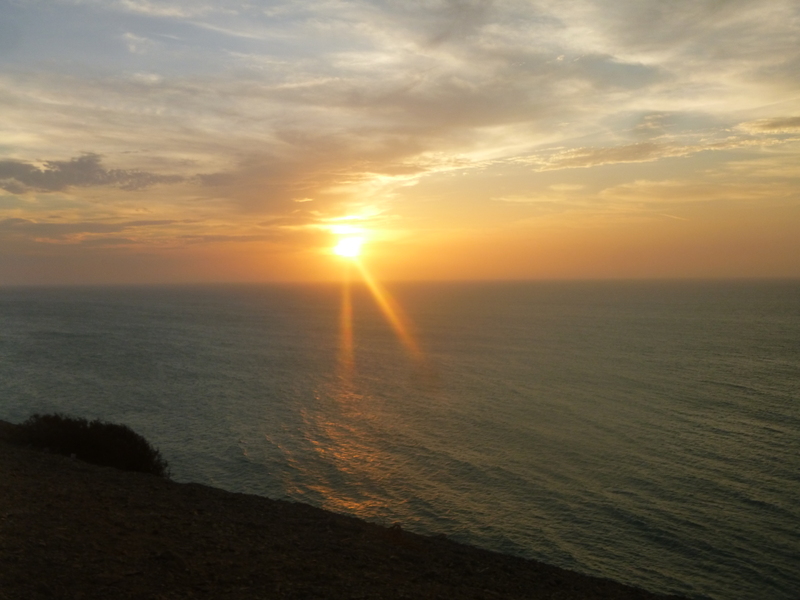 In Cabo de La Vela, one sees more tourists. 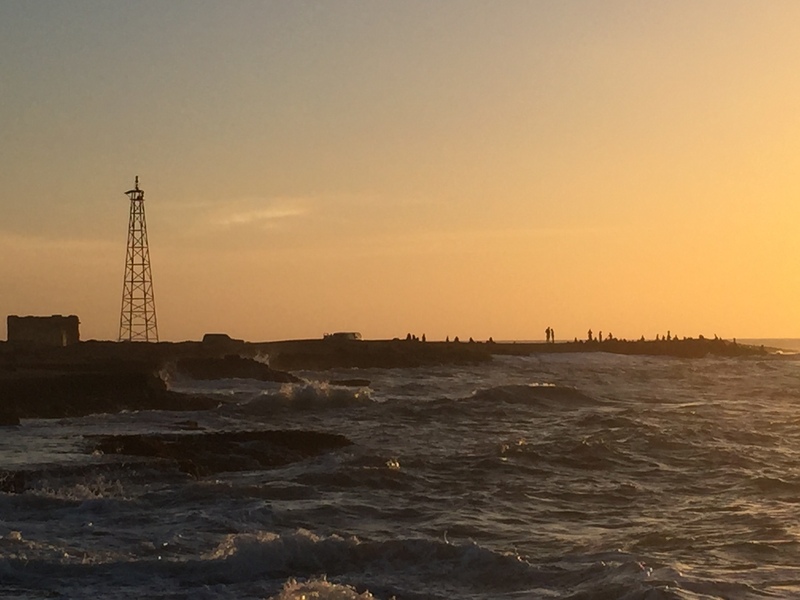 We visited a couple beaches and the lighthouse (el faro) to see the sunset. 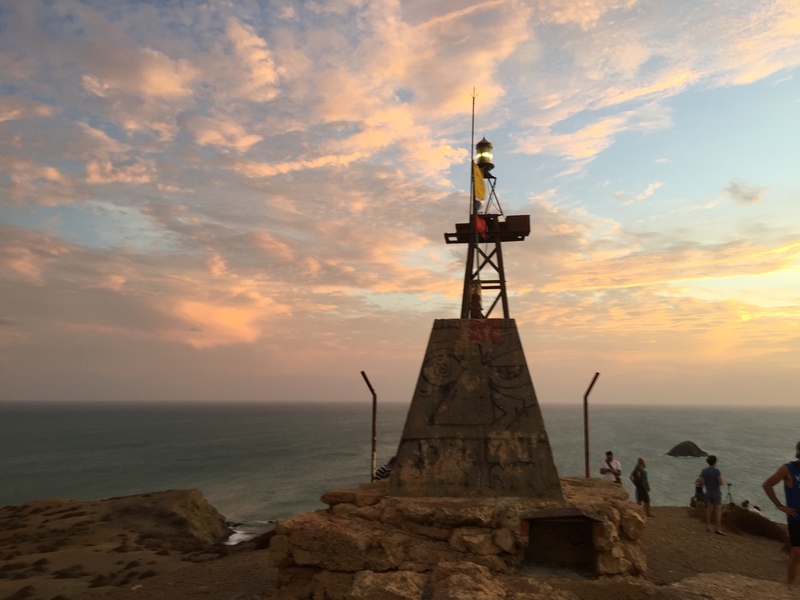 The faro in Colombia is a metal structure with light on top of a hill, not a concrete building that can be entered and climbed. Cabo de la Vela is popular for kitesurfing lessons. 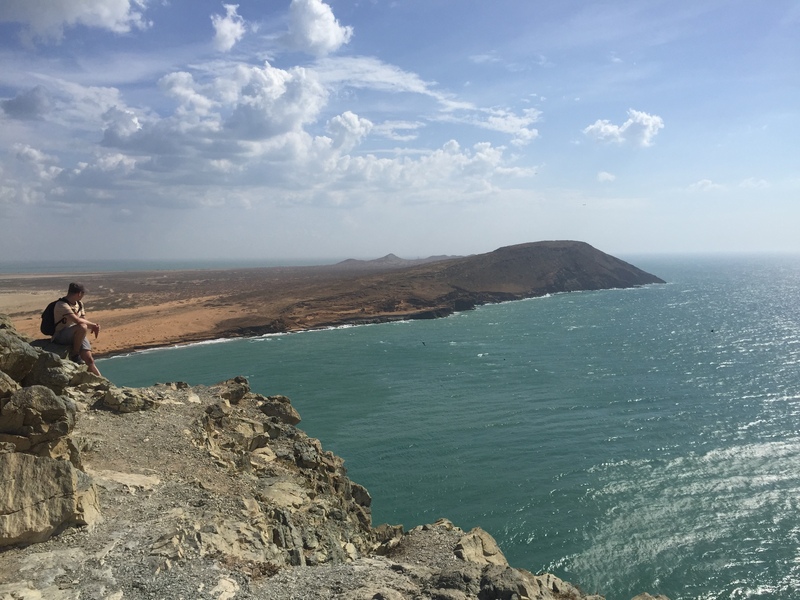 View of Cabo de La Vela From Pilon de Azucar. Were we at the end of the world?? 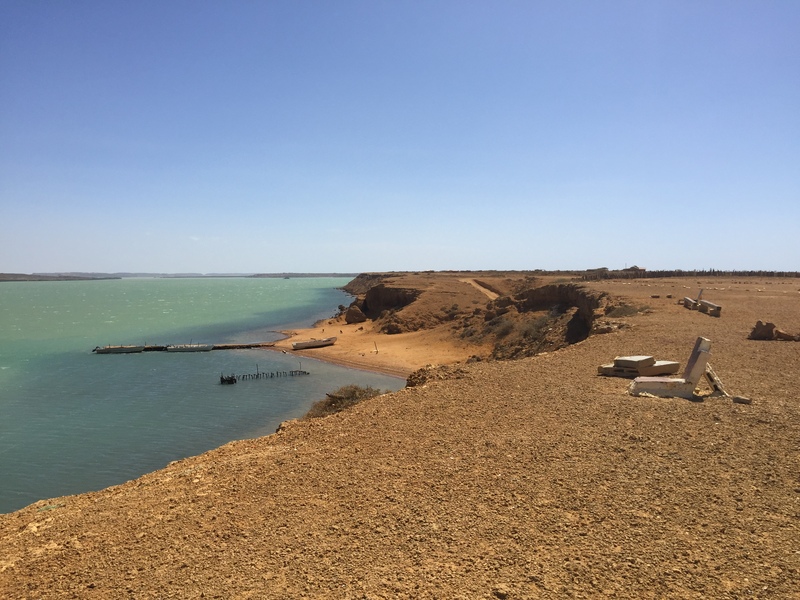 I enjoyed the drive from Cabo de La Vela to Punta Gallina. 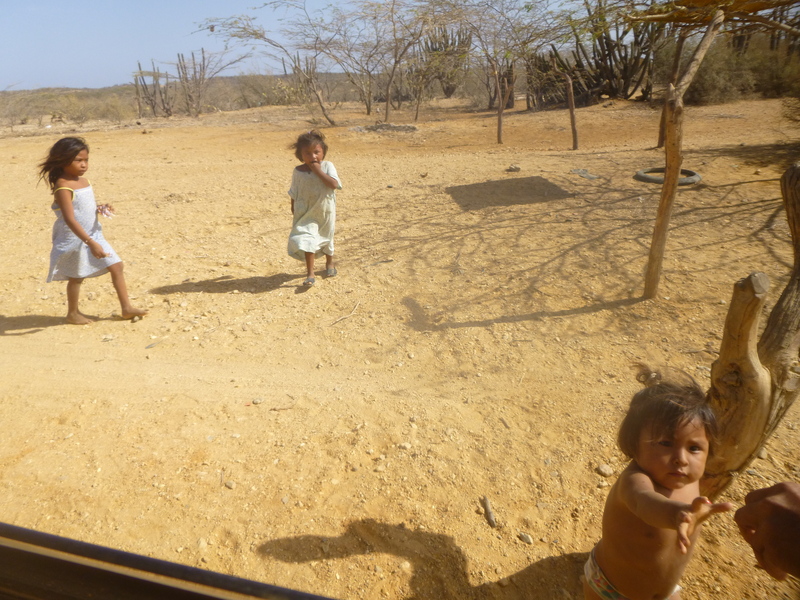 We drove through more rugged places, passing by Rancherias (small settlements of a few Wayuu’s families). We made this drive on a Sunday, and as we passed a stretch of roads, we encountered more than 10 “toll booths” (peajes). These peajes are made from ropes and attended by Wayuu children, who wanted money or candies or water or anything you will give them. This begging culture is not fantastic of course, but life is rough out here. And we were happy to note that on Monday, most of the kids were nowhere in sight. We hope they were at school, building a more secure future for themselves. We also see many Wayuu cemeteries. Life expectancies are not great for the Wayuus. Unfortunately, there is no museum or centre teaching us the culture of the Wayuus. Their bags and other souvenirs are famous though. They are sold in any artesania shops and streets all over Colombia, especially in Cartagena. Our driver, Luis, is amazing! He knows the deserts on the back of his hands! My favorite part of the trip is Punta Gallina, which is the most northern point of South America. By being here, I have now visited Tierra Del Fuego in Argentina (most Southern point of the continent) and the most northern point. It is a fun personal milestone. 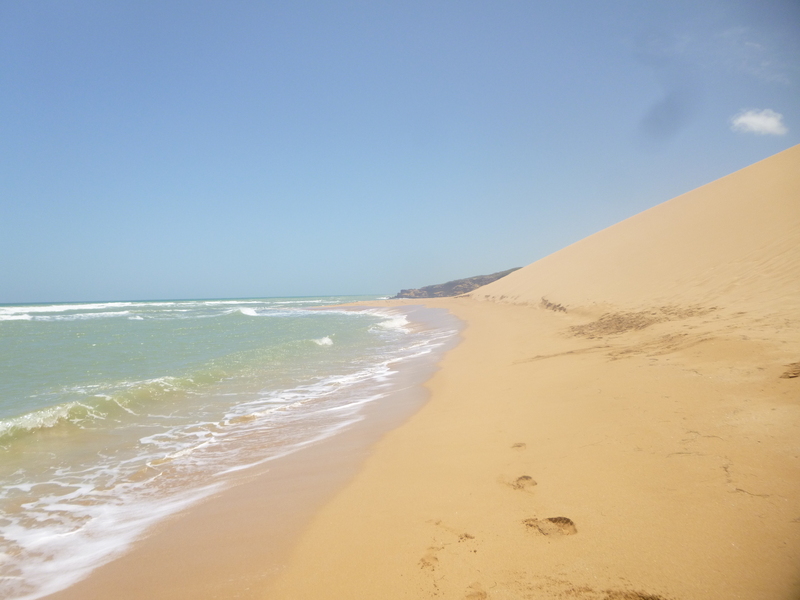 In Punta Gallina, we encountered even fewer tourists. We went to sand dunes of Taroa, and our group was the only one there. When we arrived, we saw just a big mound of sand and as we walked (on slight incline), we arrived at the top of the sand dunes with a steep drop to the beach. What an amazing view! We also had an amazing swim! What a divine beach. The sunset at the faro was also a sight. We stayed near one of the Bahias, which unfortunately is also full of jellyfish. So we had an amazing view and we could not swim. We did do an excursion on a little boat (lancha). We saw flamingos! The color of the water is just divine! Food wise, it was nothing to speak about. We did not learn what is Wayuu food. Our meals are mostly fried fish (or chicken for those who requested it) with rice and patacones. One night we did order the lobster (langosta). It was just boiled. Fresh though and cheap. Our lunch in Uribia was a bit more interesting. We had juice of “tomato de arbol” translated as tree tomatoes – we are not too sure what fruit this is. I had fish with salsa which was quite yummy and different. El Peñol is very touristy. It can be done as an excursion from Medellin. We joined a tour which I hated. It was a big bus, and it took us to uninteresting towns prior to getting to Guatape. 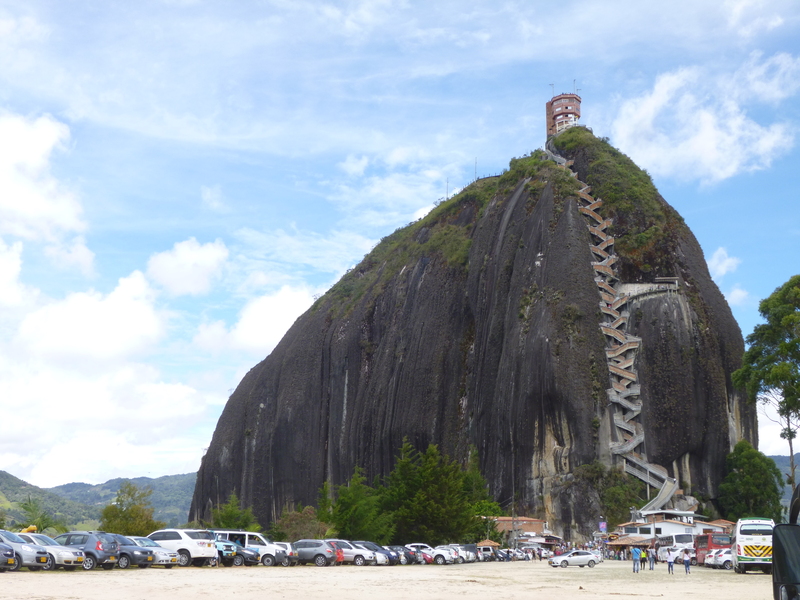 El Peñol is a massive monolith which can be climbed. One does get amazing views from up there. The climb is nothing strenuous (only 740 steps to the top of the tower) and is done on concrete stairs. There are cafes at the top where one can order refreshments and enjoy the view. I had the Antioquian ice cream flavor of mango biche (unripe mango). It was sour and refreshing! 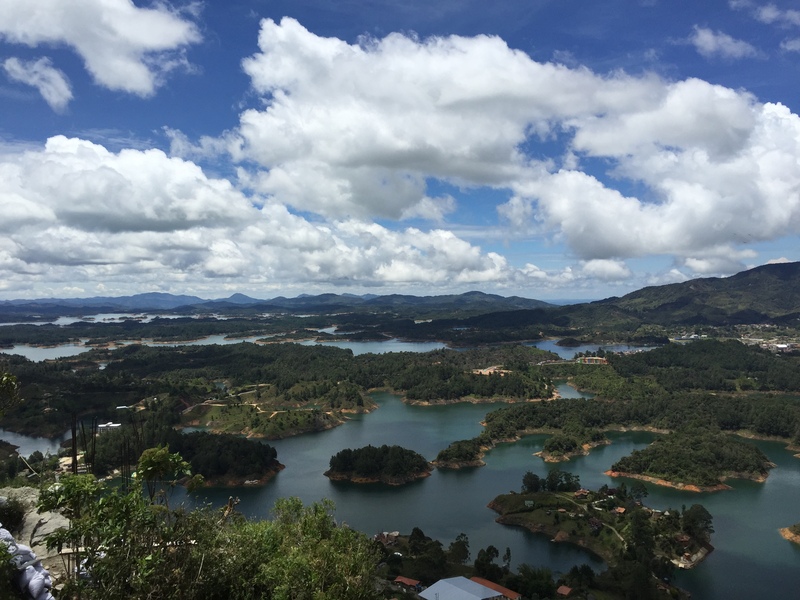 The tour also took us on a boring boat ride after walking around Guatape town. 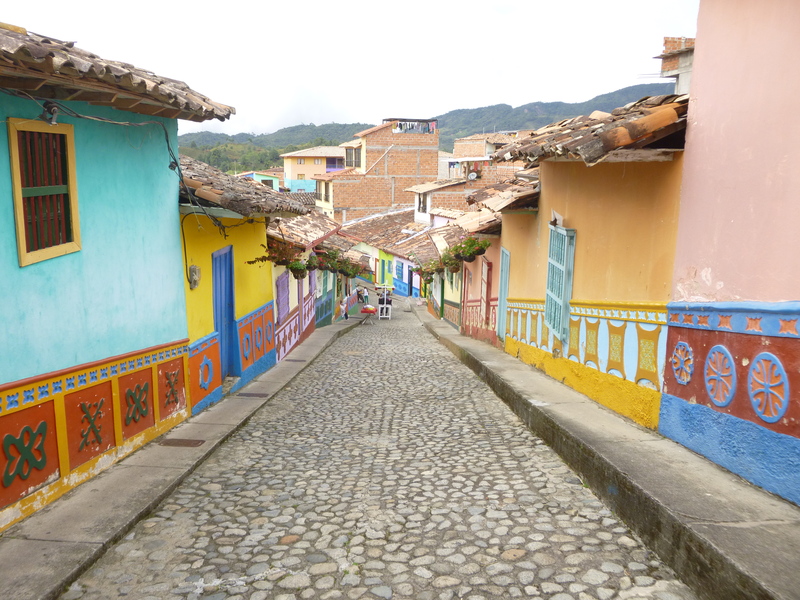 Guatape is a colorful colonial town with colorful frescoes on the main areas. My take is try to make your own way there if you do not mind the adventure of driving in Colombia. At least, you get to do things at your own rhythm. What can I say! 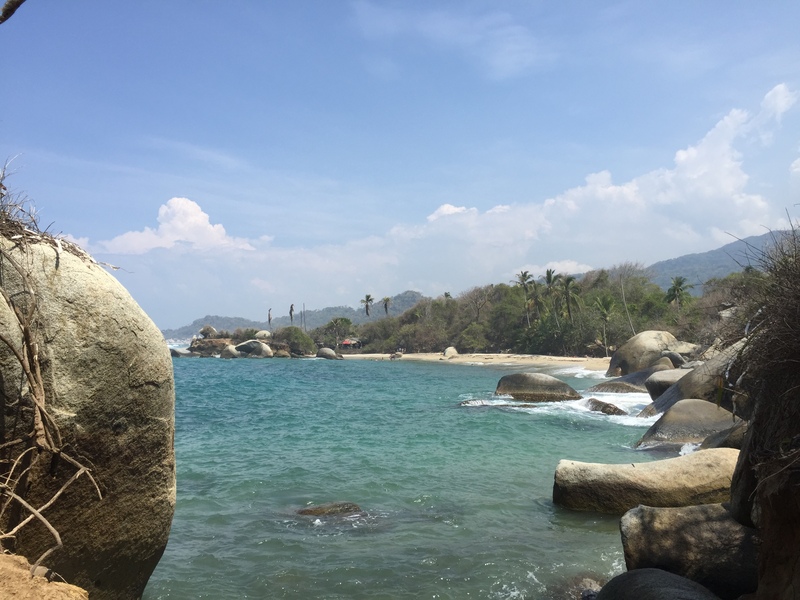 Tayrona has amazing beaches and view, although not all the beaches are swim-able due to the strong current of the Caribbean sea. The color of the water is divine, indescribably blue. Also it is rare to have a beach and the Mountains so close to one another. It is quite a unique landscape. And for me, it was a relief after four days trekking to Ciudad Perdida. 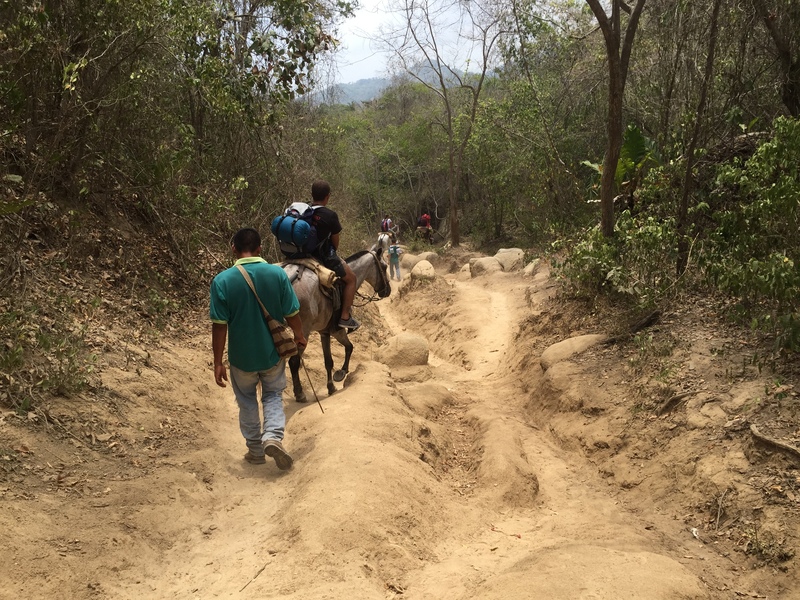 I went through the Zaino entrance, which meant I had to walk 90-120 minutes each way to get to a swim-able beaches of Cabo San Juan and La Piscina. It was hot! Cabo San Juan is the most popular spot for day trippers and also tourists who would like to camp there or sleep on the hammocks. For day trippers and solo travelers, there are lockers you can use while you swim. I also bought bread with arequipe on the beach. I decided to skip the restaurant. The swim is quite difficult for me. The water is blue and fresh and inviting, but the current is very strong. I struggled to enjoy it. On the way back, I struggled a lot from the heatstroke and arepa de huevos (egg arepa) that I bought from La Arenilla beach made me very sick. I enjoyed the walk, the view, and the beaches though. With proper hat, enough cold water, and steely determination, one will enjoy Tayrona very much. If you do not want to make the trek back and forth, you can come and/or leave with the boat to Tanganga from Cabo San Juan. I stayed at Los Naranjos beach (another divine not-swimmable beach), so I had to walk back and forth to the Zaino entrance. I enjoyed the solitude during the walk. Apart from the heat and the distance, it is not a difficult trek. Mosquitoes are also not an issue, so long one keeps moving and there is a breeze. 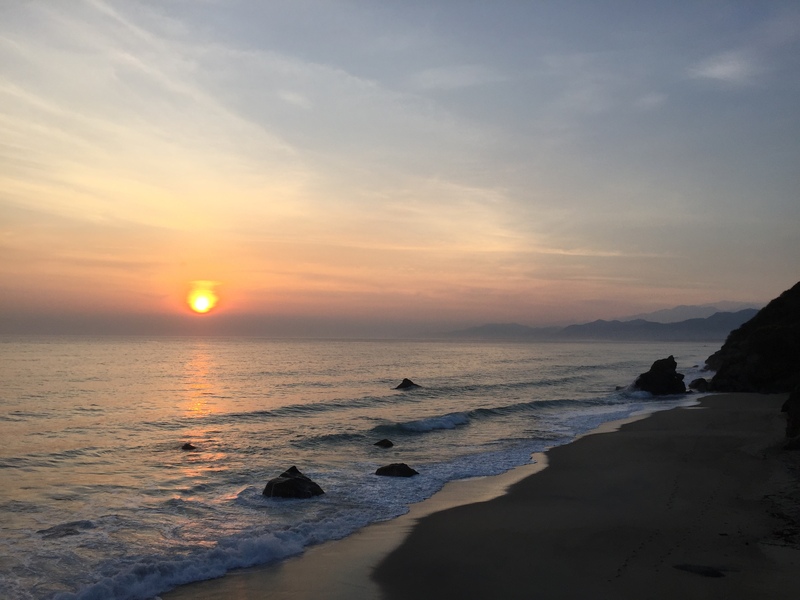 Note: I stayed in Finca Barlovento in Los Naranjos beach. It is beautiful. There is mountain and river on one side, and beach on the other side. And if you wake up early enough (around 5.30am), you will be bestowed by amazing sunrise. There is also a small ruin called El Pueblito inside Tayrona. Apparently it is a steep uphill. Since I had gone to Ciudad Perdida, I decied to skip it. For COP50,000, you can get a guide for the whole day (from 9 am to 5 pm). They will approach you as you receive the briefing about Tayrona (mandatory before they let you line up to buy your entrance tickets). What I learned about Tayrone bothers me though. It seems that the Colombian government gave Aviatur (a tour company) 80% concession to the Tayrona park. To me this sounds wrong. It is one thing to get them to operate their expensive Ecohab in Canaveral, but to actually enjoy the park entrance fees???? Why would any country give up one of their treasures???? 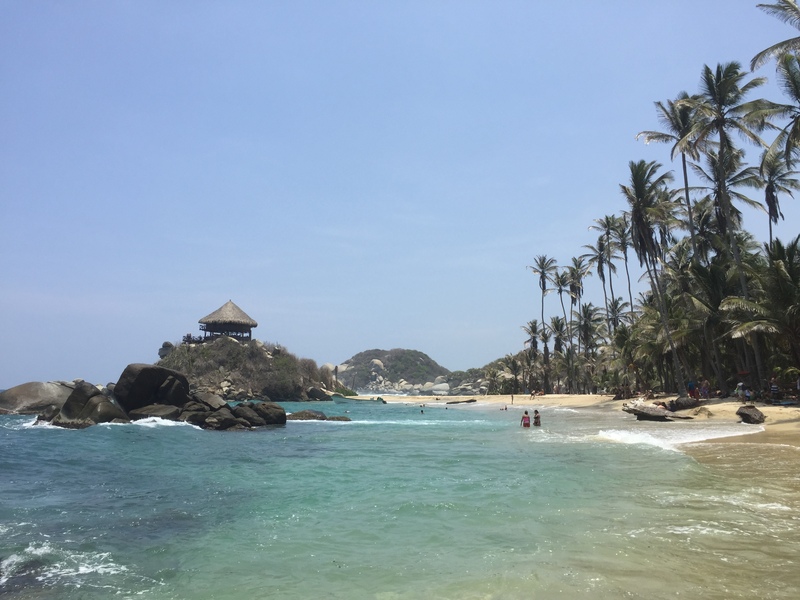 Tayrona is must-visit for anyone who loves beaches and walking and breathtaking views.